Daniel Craig's third (possibly last?) outing as James Bond sees 007 on the hunt for a stolen hard drive containing all the MI6 agents currently undercover in terrorist organisations around the globe. While he's jetting off all over the world on the hunt for the madman who organised all this (Javier Bardem) his boss M (Judi Dench) is under attacked politically for letting the whole affair get out of hand in the first place. On the surface it all sounds like a relatively straight forward 007 plot, minus the Cold War storylines of the Connery era and Fleming's original books. However beneath the surface Sam Mendes has crafted not only a genuinely great action thriller, but probably the first great piece of cinematic drama ever seen in a Bond film. The most fascinating and provocative theme Skyfall constantly drums home is the question of after 50 years whether if there's any real relevance to the likes of 007 anymore. With the latter days of the Pierce Brosnan era and even with Skyfall's predecessor Quantum of Solace you'd be forgiven that the world has moved onto younger, faster models like Jason Bourne and perhaps 007 should be confined to the pantheon of great cinematic franchises. Yet watching Skyfall - clocking in at nearly two and a half hours long - I couldn't help but smile thinking after so many years we finally have a Bond film grounded so eloquently in the 21st Century. Much more so than Craig's turn in the fantastic Casino Royale. In one of the more character driven performances of the franchise's history, Daniel Craig delivers a refreshing take on an older Bond who feels bruised, bloodied and beaten in a world which hasn't felt like his for a long, long time. More so it's a Bond film which dares to delve into his extremely cloudy past and even so far as into his childhood and his parents. All the while still attaining the trademark attributes which makes James Bond one of the most enduring fictional characters in literary and cinematic history. The star of the show however perhaps gone to the great Dame Judi Dench. Her take on M has been increasingly more prevalent ever since her first appearance in GoldenEye. With Skyfall we see her not only at her most fragile but at her best. Dare I say even worthy of recognition come award season in the Best Supporting Actress roles. In Dench's take on M, Bond has something of a kindred spirit, almost filling the gap of the motherly role left vacant from when he was a child and that dynamic is pushed home at its most in some truly terrific scenes in the film's truly breathtaking, action packed third act. All the while Javier Bardem is one of the most memorable and interesting villains seen in a Bond film since Sean Bean went all kinds of mental in GoldenEye. If Mendes' claims are true that he used Christopher Nolan's Dark Knight trilogy as a key influence on Skyfall then there was definitely an air of The Joker about Bardem's mentally unstable, highly intelligent, utterly captivating, sometimes grotesque take as the mysterious Silva. The supporting performances from past Mendes collaborators and 007 debutants, Ralph Finnes, Naomi Harris and Ben Winshaw (who shined as the new Q) just added that extra level of quality which has been absent in a lot of Bond films over the past 20 years. The great Albert Finney also makes a fantastic appearance late on. Perhaps the most disappointing part of the film was how underused the beautiful Berenice Marlohe was on screen, but then the Craig era of the Bond franchise was never as heavily burdened in the 'woman of the week' angle as much as his predecessors. Sam Mendes not only brought his film-making experience to Skyfall, he also brought that much missed cinematic pedigree to the franchise - equipped with a brilliant score from Thomas Newman and even a perfectly listenable song from Adele. As well as the plot being genuinely tense and at times quite emotional with some stunning action sequences littered throughout the film it also had that much missed visual element, that grand scale which made Quantum of Solace seem like it was done on a TV budget in comparison. Genuinely memorable moments like the explosive finale in the sparse Scottish highlands or even as trippy as the fight scene in a tower block in Shanghai. There's a moment in Skyfall where Judi Dench's M explains why the likes of 007 still matter in this world and that rings true the point of James Bond and why after 50 years he's still one of the biggest blockbuster draws that's not a superhero. He gives us glitz, glamour, action, tension, quick witted humour and with his latest entry a refreshing honesty and fragility which should make audiences all over fall in love with him again. Not only is this the best Bond of this century, but could perhaps be the best Bond of all time. Bold words but I stand by them. I personally can't wait to watch it again. One of my favourites of the year. 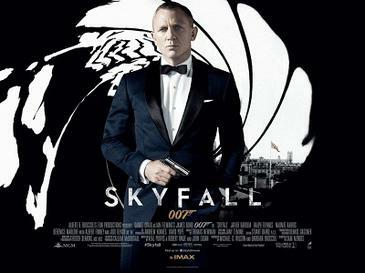 Skyfall is in cinemas everywhere now.